I believe in all honesty both she and Louie 16th were wrongly accused and tried. This tragedy should never have fallen upon them. I agree! Neither Marie Antoinette nor her husband and their child deserved such a cruel and utterly humilliating fate. If anything, Marie Antoinette over the years has gained my sympathy and empathy. Noteworthy are three things (1) she was a caring and loving mother, (2) stood by her husband, loyally, through the end, (3) her last words to her executioner, when she stepped on him accidentally, "I am sorry, Sir, I did not mean to do it", are so moving! Worthy of a Queen! She was accused of treason, and from the revolutionaries point of view, she was guilty. She had been corresponding with france's enemies in the hope of getting the revolution overturned. of course, she didn't see it like that. 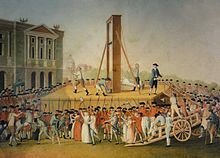 Hi, please notice this site - Execution of Marie-Antoinette. French Revolution History.